I have a wonderful accountant. Her name is Jan Jamieson of Jamieson Financial—you should hire her. She is patient, kind, and wants my business to succeed. If it wasn't for her, I would have NO IDEA how to do so many things. 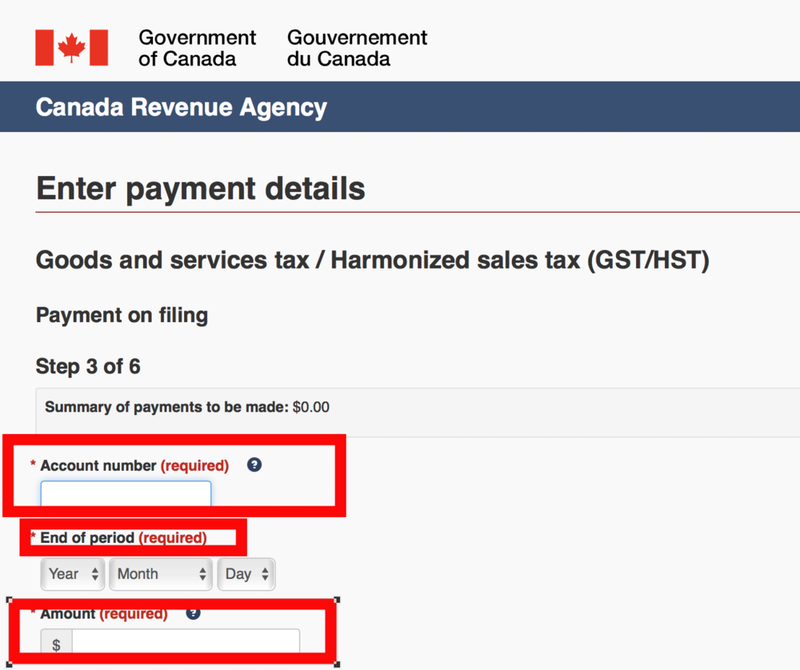 One of those things is the entire HST process: Filing and making payment. Not everyone is as fortunate to have an amazing accountant who goes above and beyond. For those of you who are in the early stages of your business, I thought I would provide a step by step of how to file your quarterly HST payments. I hope it's a blessing! Please leave a comment if you have any questions. This link should take you the below page. Hit "continue." 1 quarter: January 1—last day in March (Must file before last day in April). 2 quarter: April 1—last day in June (must file before last day in July). 3 quarter: July 1—last day in September (must file before last day in October). 4 quarter: October 1—last day in December (Must file before last day in January). 1. How much you made for the quarter (before you charged HST). 2. How much HST you collected (or should have collected). 3. How much HST you spent on your business. Once you've imported these three numbers, the website will automatically calculate how much you owe. Any HST you spend on your business will be subtracted against how much you owe. Save this document and print out for easy access. It will be helpful to give to your accountant at end of year. Step one is finished! You've filed your HST. Now you have to make your payment. Click here continue to make your payment. Scroll down to the bottom of the page and click "Pay now." 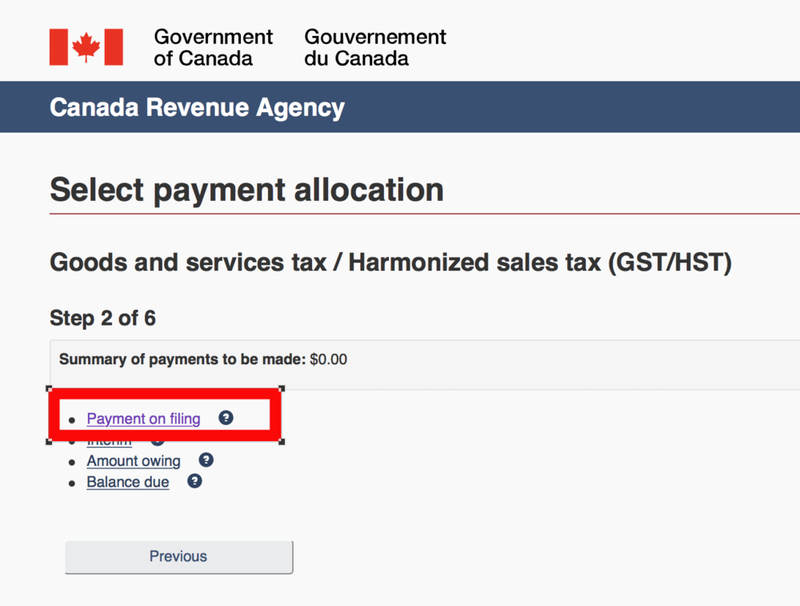 Click "Goods and services tax/Harmonized sales tax (GST/HST)"
Enter your payment details and how much you owe. Check the amount owed and click "Confirm and proceed to pay." It will bring give you the option of payment method. I prefer to do it through my online banking. Check "interact/online" and click "proceed to Online banking." Choose you financial institution. This will take you to login to your online banking and will allow you to easily make a payment. When you've made the payment through your online banking, it will provide you with a transaction receipt. Save this and print it out to have for easy access. To find what the HST is of a total number do the following formula: Price /(divide) 1.13 (100 / 1.13 = 88.49). If you did not charge HST, but have an HST number, you still have to pay HST! This is the formula to help figure out what part you owe. This is especially helpful if you have contracts before you applied for your hst. Once you have your HST number. 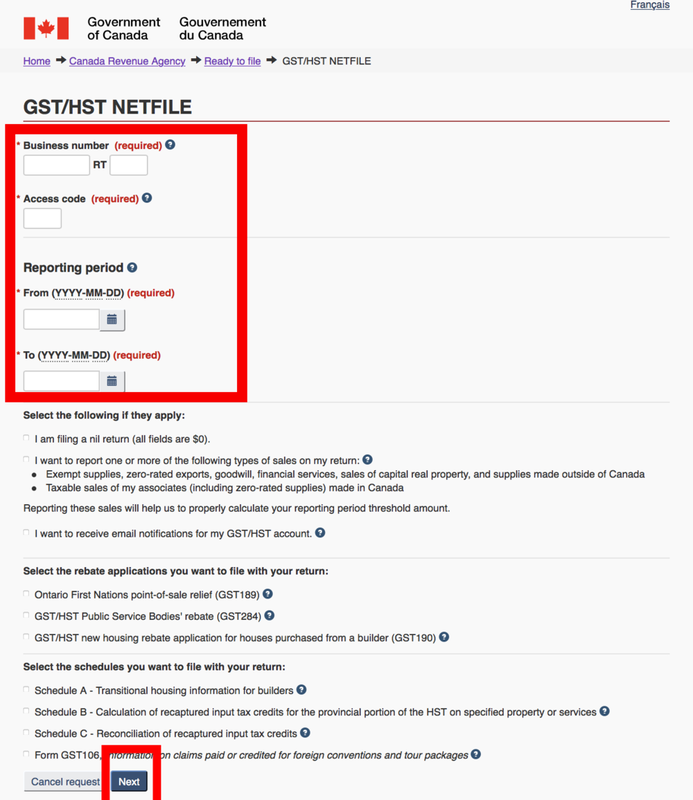 You HAVE to pay HST on all income after the date you've registered. Since you've already made a contract with someone, you can not charge them HST, so you will have to eat the cost and pay the HST yourself. Why do I do quarterly instead of annually? Doing quarterly filing keeps me organized because it forces me to have all of my numbers in order every three months! If I get behind, it's only 3 months worth of receipts and importing (about 2 hours worth of work, including filing). If I were to do it annually, I would have much more work to do at once. At the end of the year, my yearly business and income taxes are done! Though I am habitual about setting aside the HST immediately after it's brought in, it can be easy to neglect and then get hit at the end. Doing it quartely makes for no big surprises at the end of the year where I thought I had thousands of dollars more than I did! (CPP and income tax are usually a big enough surprise). In my last post, I shared How I Organize My Emails. This time, I'd like to share how I respond to emails and business inquiries. Clients are often emailing a handful of potential photographers to see who is available. Responding promptly might be the deciding factor of whether or not you book the wedding. I've definitely booked weddings because of quick replies. When deciding between two photographers, the couple went with me because my promptness in responding built trust and demonstrated professionalism and customer service. By the time other photographers had sent their first response, the clients and I had already corresponded back and forth a handful of times. Your clients need to trust you; responding in a prompt manner is the first step to build this trust. Now, it's not always possible to answer right away, and often emails can wait. But the first few emails in the correspondence are particularly important—both for the client and the photographer. The reason an email only takes a few minutes to respond to is that I try to keep them short, sweet, and to the point. I don't want my emails to be tiresome and feel like a burden to read. Most of my emails can be written in three to five sentences. I give the information they are requesting, congratulate them, ask them a few questions, answer their questions and set up a time to meet. However, I never want to sacrifice friendliness on the altar of brevity. Brevity is essential to me, but brevity can be interpreted as cold and unfriendly if not done well. Impressions are important, so be friendly. A photographer should be someone who the couple likes (they have to spend their entire wedding day with you!). If you don’t give a friendly impression in over email, it’s likely the client will not want to follow-up with you further. Along with being prompt, brief, and friendly, I always try to follow up. Couples are busy with wedding planning, jobs, families, and other important things and are not always super organized—that's okay! If they haven’t responded in a few days, it is helpful to send a follow-up email to make sure they have received my reply. Emails often are forgotten about, so a follow-up is always appreciated. It is also helpful because it shows you care and are organized and professional. Sometimes clients don't follow up because they end up booking with someone else, and sometimes they just get busy and forget! A follow-up email helps inform me whether or not a couple is still interested, and if not, helps me feel comfortable that I no longer have a responsibility to them. These principles may seem like common sense, and they are! But sometimes the most basic rules are the most helpful for us to get down to an art. By focusing on replying quickly to your potential clients in a brief, friendly manner, and following up if you don’t hear from them, you will help keep the lines of communications open between you and your clients, which is essential to booking weddings and building strong relationships with the people who are entrusting you with a lifetime of memories. I do almost all of my communication with clients through email—not by phone, texting, or facebook messenger. Email helps me track all of my correspondence, and keeps me organized so I don't miss anything! There are so many details to keep on top of as a wedding photographer, and many of those are subject to change throughout my clients’ wedding planning process. Locations, dates, times, and details of rehearsals, morning prep, first looks, ceremonies and receptions can be hard to keep track of if you’re communicating on multiple platforms. All of my communication with clients is available in one spot for easy access. It is easy to let emails go unorganized. Since the details in my emails with clients are super important to my business, it is essential that I keep everything organized. Thankfully, I kind of geek out over being organized, so I have enjoyed fine-tuning my email filing system over the years. I’m at the point now where I have a completely empty inbox, with all of my communication sorted into folders. My wife, on the other hand, currently has 593 unread emails in her inbox, and that can feel kind of stressful! It’s a very satisfying feeling to open my email and see only 1 or 2 unread emails pop up. Each one of my wedding clients gets their own assigned folder in my inbox. Assigning them a folder helps me to track all of our conversations throughout the whole process and puts them in one spot for quick access. If a client messages me on any other platform regarding specific details for their wedding, I always move the conversation back to email. It’s easy to forget details, so having them all in one place is essential. I also have a folder for Inquiries. This folder helps me keep track of potential clients that I need to follow up with. As soon as I have an inquiry, the email gets thrown into that folder. If we move forward, I move them into the folder for the year, and if we don't move forward, they are archived. Folders are great ways to save anything you want to be able to access quickly. I have a folder for anything educational and helpful for my own business, as well as communication from a beginner workshop that I hosted. I recommend going with a separate, professional email that corresponds to your business. It's worth the $5.00 a month with Gmail to get a business email. It helps to keep personal email separate, and a business email is more professional than a regular Gmail account. If you have any questions, please don't hesitate to ask them in the comments!